Standing on a stage, lights dimmed except for the high-powered spotlight shining in my eyes. A room of 500 industry experts in web design, analytics and research all waiting to hear what I had to say. Throat dry but palms sweaty as they rest on the side of the podium, first slide of the presentation hovering on the screen behind me. Stomach churning, heart pounding. And then somehow I manage to start talking. Was this a nightmare I had recently? No. 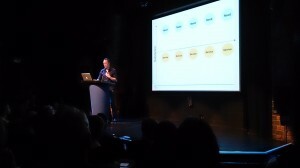 This was the first few seconds of a presentation I gave at NUX2 (http://uxmanc.co.uk/), a conference for those in usability, information design and all aspects of the user experience. Developers, designers, academics, usability specialists, accessibility experts, copywriters and technical authors were all in attendance and I was there to deliver a talk on Customer Insight in an Agile Environment. Over the past few months I have written several blogs around some of the research we have conducted at DVLA – particularly around improving the customer experience of our systems. The organisers of NUX2 had seen these and asked for me to come along and talk about some of the methodologies we use. “Sure!” I said enthusiastically but without much understanding of what it would actually involve. As time went on and I started putting my slides together I realised how daunting this was going to be. I’m the kind of person who throws himself into things and I thought this time my mouth had really got me in trouble. The venue was fantastic, the Comedy Store in Deansgate, Manchester. I looked at all the photos of the world-famous comedians who had stood on the same stage looking out at the same sea of seats as I was and before I knew it the lights had dimmed it was time to go on. My presentation covered how we integrate customer insight into an aggressive agile development cycle and focused on two qualitative methodologies – usability testing and customer journey mapping. I talked about the phases of an agile project and the myriad of opportunities we have to obtain customer insight, ensuring our products and services are built with the user firmly in mind. Usability testing involves taking a prototype of a new product, showing it to customers in one to one sessions and watching how they interact with it; capturing any defects, areas of confusion and suggestions for improvement. We usually test with six to twelve individuals per session and set them a series of tasks to complete that mirror how the product would be used in real life. These results are then used by the developers and the latest iteration of the product tested again. This cycle continues until you eventually end up with a product that is intuitive, attractive and works in the manner in which it is intended. Customer journey mapping on the other hand is all about the experience a customer has when they interact with us as a business. Any time a customer has contact with us, whether through an application, telephone call, reading a leaflet, receiving their driving licence and so on; all of these are touchpoints. A touchpoint either has the potential to impact positively or negatively on the customer experience. It is a useful exercise to map out what the keys steps are in the journey and how these meet the customers’ expectations. You can gather vital information from this process – for product development, strategy implementation, channel shift and of course ensuring that user interaction with us is a positive experience. The forty minutes I had on stage flew by and surprisingly I enjoyed it all. I was talking about a subject I know to a room of like-minded people. The audience seemed engaged throughout and really keen to ask me questions, both immediately after the talk and in the breaks that followed. My twitter feed was soon abuzz with attendees quoting what I was saying, retweeting and sending some great feedback and since I’ve been back in the office I’ve had emails and phone calls from people in both the public and private sector, hoping to discuss some of the work we do. All exciting stuff! I was really grateful to all of the people at NUX2 that made it such a worthwhile experience. It gave me the opportunity to showcase how important customer insight is to our product development in DVLA.I hope that those in attendance were able to take some hints and tips from the great work we are doing in customer experience and research.